The capacity to manufacture and export top-end high-speed trains and related equipment is giving a new sheen to the image of China, for long considered maker of low-quality, cheap goods like bags, shoes and lighters. Even foreign governments and corporate clients are sitting up and taking notice. China is in talks with more than 30 countries including the United States, Russia, Brazil, Thailand, Turkey, Saudi Arabia and Iran about high-speed rail projects, said Wang Mengshu, a deputy to the National People's Congress and deputy chief engineer of China Railway Tunnel Group Ltd.
"China's first high-speed rail project in Indonesia will arouse more countries' interest, which are keen to put their economic growth on a firmer footing through efficient transportation systems and regional connectivity," said Wang. China was selected by the Indonesian government to build the nation's first bullet rail link－the 150-kilometer Jakarta-Bandung link last year. It is responsible to construct the $5.5-billion high-speed railway line from Jakarta to Bandung in the Southeast Asian country. With the operational date scheduled for 2019, the project will be developed by PT Kereta Cepat Indonesia-China, a joint venture formed in October 2015 between a consortium of Indonesian state-owned companies and China Railway International Co Ltd, a subsidiary of China Railway Corp Group. The project is financed through a Chinese loan provided by China Development Bank which provides around 75 percent of the funding, with the rest arranged by the joint venture partners. "Even though China is a latecomer to the field in comparison with its German and French rivals, its rail equipment companies have thrived thanks to cost advantages, reasonable delivery times and flexible financing models," Wang said. Eager to compete with established rivals in Europe, Japan and Canada, China will further develop "smart trains", which apply intelligent technology that will allow trains' speed control, condition determination and fault detection to be performed digitally, Wang said. The Chinese government announced in September a 370-kilometer high-speed railway project between Las Vegas and Los Angeles will be built by a joint venture by Chinese rail companies, including China Railway Construction Corp, China Railway Corp, and XpressWest Enterprises, a US passenger rail service provider. The construction work between Nevada and California is expected to start as early as this September, and the estimated investment for the project is $12.7 billion. As a result, China Railway Rolling Stock Corp, the country's largest train manufacturer, plans to deploy more resources and manpower in the global high-speed rail equipment market, especially in developed economies such as the US or the United Kingdom to fuel robust growth over the next decade. CRRC was formed by the merger of China's former top two train manufacturers, CNR Corp and CSR Corp, last year, a major step that the Chinese government took to accelerate reform of its behemoth State-owned enterprises, in a bid to push them toward gaining more overseas projects. Yu Weiping, CRRC's vice-president, said the company is ready to contribute to a new high-speed rail culture in the US, after it invested $60 million to build a new manufacturing facility to produce railcars in Springfield, Massachusetts, last year, after sealing a deal with the Massachusetts Bay Transportation Authority to design and supply 284 railcars for the Boston transit system's Orange and Red lines. "With high-speed trains traveling at a speed of more than 300 kilometers per hour, it will help the US to change the situation of that country's ground commuting systems that have long been dominated by automobiles," said Yu. The entire range of CRRC's products, including diesel locomotives, electric multiple units and light-rail vehicles, has been exported to nearly 100 countries and regions. Yu said the company's next step is to gradually switch focus from product exports to capital and technology exports in the global market. CRRC is preparing to export bullet trains for a high-speed rail project in Russia that would connect Moscow to Kazan. The length of the line is expected to be about 770 kilometers and will run through seven Russian regions with a total population of more than 25 million. The Chinese company has 46 wholly owned or holding subsidiaries and more than 170,000 employees. It has already built manufacturing facilities and maintenance centers in Malaysia, Turkey and Brazil. 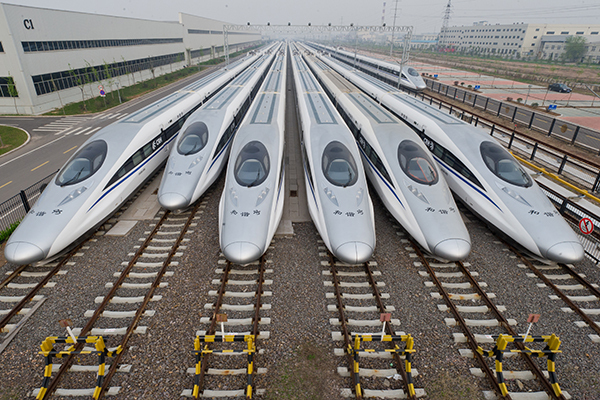 Sheng Guangzu, a deputy to the National People's Congress and general manager of the China Railway Corp, the country's railway service provider, said the Belt and Road Initiative will help China export more high-speed rail technologies and related products to a number of lucrative markets during the country's 13th Five-Year Plan (2016-20). The initiative, proposed by China in 2013, is a trade and infrastructure network that includes the Silk Road Economic Belt and the 21st Century Maritime Silk Road. 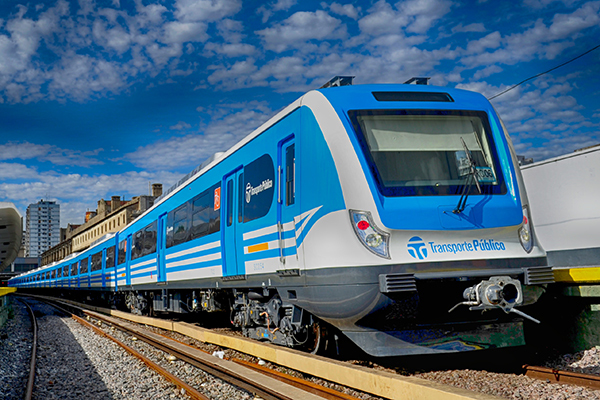 The planned network connects Asia, Europe and Africa and passes through more than 60 countries and regions. "China will quicken the pace of promoting its railway standards abroad, especially in the markets along the Belt and Road Initiative," said Sheng. 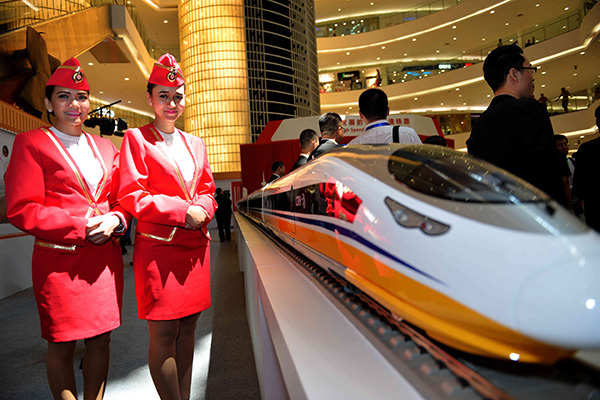 "Because most countries along the Belt and Road Initiative, especially Central Asia, Southeast Asia, the Middle East and East Europe are planning to build high-speed rail lines or upgrade their existing railway systems, they are keen to acquire technological support from China to assist in the daily operations, maintenance, staff training and other services," said Zhou Qinghe, president of CRRC Zhuzhou Electric Locomotive Co, a CRRC subsidiary based in Zhuzhou, Central China's Hunan province. A Chinese consortium led by Third Railway Survey and Design Institute Group Corp was also chosen to conduct the feasibility study on a planned New Delhi-Mumbai rail project, a big step forward to the development of the Indian rail market. Another high-speed rail project in India, to connect Mumbai and Ahmedabad, both provincial capitals in the western region, was awarded in December to Japan, which had lost out to China in the race for the Indonesia project. China will support rail equipment makers in widening their global services and production networks in other regional markets during the 13th Five-Year Plan period, according to the Government Work Report delivered by Premier Li Keqiang on Saturday. China exported railway equipment worth 21 billion yuan ($3.23 billion) between January and October last year, up 36 percent year-on-year, according to the latest figures released by the National Bureau of Statistics. "Widening the international sales network and manufacturing bases in overseas markets can help Chinese rail equipment, infrastructure and service providers enhance their localization abilities, as well as gaining political and public support through local employment," said Shen Danyang, spokesman for the Ministry of Commerce. Domestically, China had constructed more than 19,210 kilometers of high-speed railway network throughout the country by the end of 2015, building a solid foundation for an industry that can generate new market growth points during the nation's 13th Five-Year Plan period.